Sometimes it’s difficult to get inspired. Sometimes I have so much food in the refrigerator and so many ideas for it floating around in my head that I just panic and end up procrastinating. Then I stop and think; is this a problem? How lucky am I that I have a refrigerator full of food to use however I chose? I do remember being a kid and being taught to clean my plate fully at each meal. It was hard not to argue with the ‘clean your plate or we’ll send it to the starving kids in Africa’ routine. It did teach me to be thankful for what I have and I hope that I’ve passed on this thankful attitude to my kids but in a different way, without the ‘Africa’ guilt trip. Certainly they’ve eaten many kinds of food from around the world in my kitchen and have been well adjusted and less picky because of it. Summer’s bounty has made my refrigerator even more full. I’ve got all sorts of stone fruits, apples, melons, and berries just waiting to be eaten. 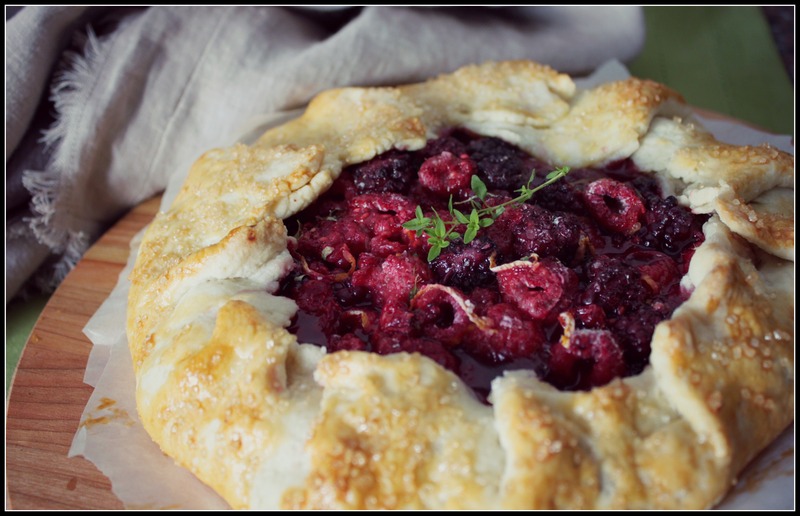 Once this Summer Berry Galette with Lemon & Thyme showed up on my twitter feed I just couldn’t get it out of my head. At least now I knew what to do with the berries! A galette is much easier and way more forgiving to make than a pie. I find that the more rustic it looks, the better. So if you not a ‘pastry’ person this galette is perfect for you and how lucky that it tastes amazing too! 1. Add the flour, sugar, and salt to the food processor, and pulse a couple of times to combine. Add the butter, and pulse until it is cut roughly into almond-sized pieces. Add 3 TBSP of water, and the almond extract, and pulse again to distribute the water evenly. 2. Dump the flour mixture into a bowl, and use your hands to press and squeeze the dough until it starts to hold together. If necessary, add the remaining TBSP of water. 3. Once the dough just holds together, shape it into a ball, and place on a sheet of plastic wrap. Flatten the dough into a disc, about 1 inch thick, and wrap it tightly. Refrigerate for at least 1 hour. Can be made up to a few days in advance. 2. In a small bowl, mix together the almond flour and 3 TBSP of the sugar. Set aside. 3. In a large bowl, combine the berries (washed and dried, strawberries hulled and cut into quarters), lemon zest, corn starch, and remaining 5 TBSP of sugar. Remove the leaves from the thyme and chop finely, then toss in with the berries. 4. On a well floured surface, roll the dough to about 12-14 inches in diameter, and about 1/8th inch thick. Carefully transfer to a parchment-lined baking sheet. 5. Spread the almond flour mixture evenly onto the center of the disc of dough, leaving a boarder of about 2 inches around the edge. Pile the berry mixture on top of this, then fold the edges of the dough over the berries. 6. Brush the edges of the dough with the beaten egg, and optionally, sprinkle with a little extra sugar. 7. Bake for about 50-60 minutes, or until the crust is golden and the berries are bubbly. Your time may vary so check on it periodically until the crust is a nice golden colour. To be honest you could make this galette with any fruit and not be limited to just berries. I bet it would be great with apples, pears, or some peaches. You could experiment with using different herbs for those fruits or leave them out completely. I found that having that flour/sugar mixture lining the pastry was great for soaking up juices and keeping that crust nice and crispy. This galette didn’t last long in our kitchen…no food wastage in this case!